Sophisticated service soars to new heights. High is the level of glassblowing artistry: an arcing handle springs gracefully from a 42 oz.vessel, the crystal embodiment of a beloved water-dweller. Among the world's most break-resistant decanters, lead-free and reinforced with magnesium. Sophisticated service soars to new heights. High is the level of glassblowing artistry: an arcing handle springs gracefully from a 42 oz. vessel, the crystal embodiment of a beloved water-dweller. Among the world's most break-resistant decanters, lead-free and reinforced with magnesium. Can the decanter be personzlized with a message or just initials? At this time it can only be personalized with just initials. Currently, it can only be personalized with initials. It can be personalized with initials. I was wondering if you could engrave OURS on the decanter ? Will the Decanter hold a entire bottle of wine? BEST ANSWER: Yes this will hold 42 ounces which is larger than a 750 ml bottle of wine. 750 ml equals appx 25 ounces. This will hold up to 42 ounces. Are you able to possibly put 2 initials or a monogram? BEST ANSWER: Thank you for your inquiry. Unfortunately, we are only able to put a single initial on this item at this time. If you have any further questions, feel free to reach out to us at 800 356 8466. Thank you again. There is only an option for a single character. Can we use a personalized logo instead of a single letter to personalize it? This decanter looks adorable on my book case, but also opened up my wine beautifully. Everyone who has seen it has commented on how pretty it is. 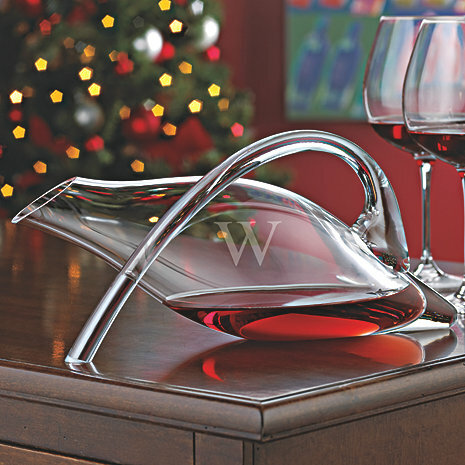 It’s beautiful and personalizing the decanter makes it very sophisticated and special. It was a Birthday gift for our nephew and he Loved it!! I highly recommend the Fusion Duck decanter. It is an impressive design with a good QPR. It makes for a great gift for friends or clients. You qont be disappointed!